Indiana Convention Center, Indianapolis, Indiana. Gear Expo is a biennial event and the world’s only conference and expo designed exclusively for the gear industry. For three days, gear buyers and manufacturers network and build relationships that benefit their respective companies. Attendees see firsthand the latest technology on the market and discuss trends in the industry with experts. Exhibitors have the opportunity to meet face-to-face with attendees and other exhibitors and will display more than 750,000 pounds of machinery on the show floor. Thousands of professionals from around the United States, international manufacturing hubs, and emerging markets conduct profitable business transactions and collaborate on the innovations that make their operations more streamlined. 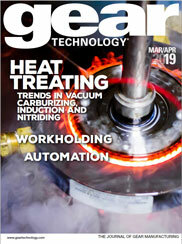 The ASM Heat Treating Society Conference and Exposition is co-located with Gear Expo 2013.